Laird regularly hosts a Leadership Meeting to bring senior leaders together from across the globe. This year a smaller than usual group gathered purposefully to workshop and focus on leadership, culture and strategy. As a long-time partner with Laird, the Ballyhoo team was brought to the table once again to help pull together a meeting with an intimate feel and clear objectives and strategy for the company’s top global leaders. Corporate Meeting To Do – Done! At Ballyhoo we talk about corporate meetings and events as a checklist with a thousand to-dos, from logistics to creative, and production to the wrap-up. Those checklists take time to complete and resources that many of our clients aren’t able to spare. We partnered with Laird to step in and attack the checklist. 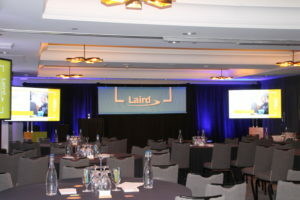 We created the look, tone and feel (LTF) and communication materials that set the event apart from past meetings, but still connected it to the overall Laird brand. Ballyhoo developed and managed everything attendees would see, touch and hear throughout their time in Seattle. 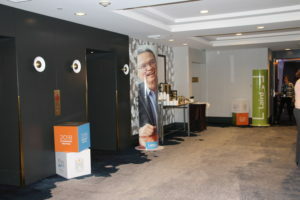 From signage to presentations to video to giveaways and staging, every element reflected the overall messaging and look to provide a seamless experience for the attendees. The Ballyhoo team also traveled to the meeting to manage the production and branding of the event and continue the collaboration with executives on their presentation content and delivery. Outside of the main event, each business division held sessions to further discuss strategy and plan implementation. Again, Ballyhoo created the messaging and branding that connected to the brand themes while being customized for each division. The global meeting was a success, giving each attendee a renewed sense of the culture, values and direction for business strategy. Due to the professionalism of the branding and event support, many in the Laird team have reached out to Ballyhoo for additional work in further telling their story. 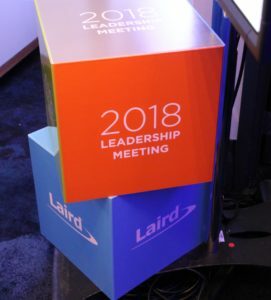 Laird worked with us to utilize our Executive Presentations, Graphic Design, Corporate Events, and Video Production solutions to take an event in a new direction and re-energize a global team. Let us know how we can help you finish your corporate event to-do list!